Last year we were introduced to the surprised reveal of the Lincoln Continental Concept. It made a huge splash and somewhat stole the show from the Cadillac CT6 announcement. We all wondered how much of the total redesign of this Continental would carry over to the production model. Well Tuesday’s reveal at the North American International Auto Show lets us see the final production model. In my humble opinion, the production model looks better than the concept. Though the concept was great in its grandness, the production model seems more mainstream and still carries over enough of the concept to be all that it is intended to be. The grandest model in the Lincoln stable and worthy of being a limousine for the wealthy in this as well as other worldwide markets. To it’s credit, Lincoln chose to “de-bling” it a bit. I like the fact that it’s more mainstream. True the worth of any concept is in the over the top details. But it was just something about the concept last year with all its blue, velour surfaces and bright chrome work inside that put me off a bit. It just didn’t seem “neat” or “modern”. I guess that’s what they were reminiscing about anyway. It could have been a reflection of the old days of the 70’s when the Town Car and the Cadillac Fleetwood was over the top in its plushness. These days we’re more into efficient tech and capabilities. In any event, I’m glad to see the new offering still looks great. Hopefully it can revitalize the Black Car market here in North America as well as in Asia. It looks great on the stage, so I can’t wait to see it on the street to see if it holds the same curb appeal. I think it should. 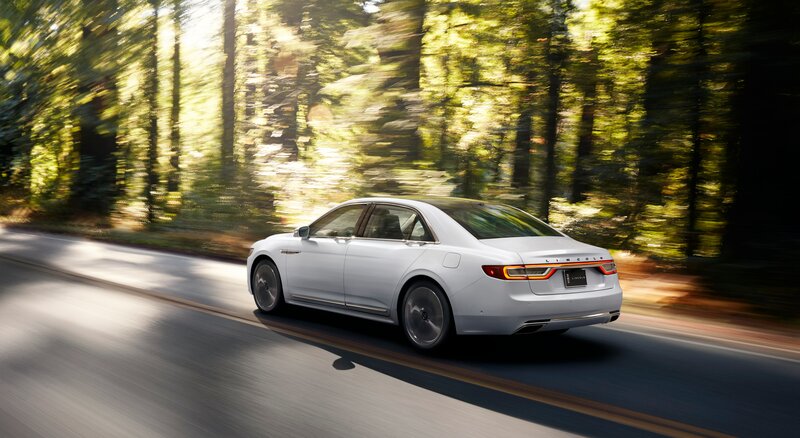 All-new Continental design is thoroughly modern, with Lincoln’s new signature grille and an athletic profile that is dynamic and progressive. Lincoln’s new flagship welcomes drivers with a brand-exclusive lighting sequence. As the driver approaches the car with the key, LED signature lighting in the lower front fascia and taillamps subtly engages, while signature lighting in the headlamps awakens in a fluid motion. Lincoln mat lights then brighten the pavement around the front doors, helping show any hazards, while select interior lights warmly illuminate the cabin. Continental door handles are designed to offer elegant and effortless entry with new E-latch door release. The release is discreetly integrated within the beltline, leaving the body side clean. With the gentle touch of a button, the vehicle’s doors pop open, then use available power-cinching technology to automatically close and secure. An elegant available panoramic sunroof covers nearly the entire roof area; the front half slides up and over the rear – creating a large open-air driving experience and an even greater feeling of spaciousness for up to five Continental occupants. Continental offers available technologies that help create better and safer drivers. The all-new Lincoln-exclusive 3.0-liter V6 engine with twin turbochargers that produces a projected 400 horsepower and 400 lb.-ft. of torque  is designed for smooth, responsive, yet quiet power. Continental’s available all-wheel-drive system is paired with Dynamic Torque Vectoring that transfers torque on demand to the appropriate rear wheel when driving through corners – providing confident handling and stability. Lincoln Drive Control provides the driver a choice of three settings – comfort, normal and sport – adapting steering and suspension settings to tailor ride and handling. Available adaptive steering helps optimize steering response, enabling the vehicle to react more smoothly and precisely to driver input. Pre-Collision Assist with Pedestrian Detection uses radar and camera technology to scan the roadway ahead and, if a collision risk with a vehicle or pedestrian is detected, provides a warning to the driver. If the driver does not respond in time, the system can automatically apply up to full braking force to help reduce the severity of or even eliminate some frontal collisions. Pre-Collision Assist may help drivers avoid rear end collisions with other vehicles at all speeds, while Pedestrian Detection can help the driver avoid pedestrians at lower speeds – both may reduce the severity of forward collisions or even prevent certain forward collisions. Effortless assistance for the daily commute is available with optional adaptive cruise control, which can automatically slow Continental in stop-and-go traffic – resuming speed when traffic clears. To take the stress out of parallel and perpendicular parking, the new 360-degree camera system uses views from cameras mounted in the grille, decklid and 180-degree side mirrors, then seamlessly stitches these snapshots together to create an image in the screen so the driver can see around the car – as if a camera is overhead. Tested with 93-octane fuel. Driver-assist features are supplemental and do not replace the driver’s judgment. The all-new Continental interior is designed to help all occupants rejuvenate. One highlight is Lincoln’s new Perfect Position Seats – inspired by private jets and high-end office furniture – that can be adjusted up to 30 ways. The patented design allows the seat to adjust to an individual’s body shape and weight for optimal stretch and comfort. Available features of these seats include massage, heat and cooling; and independent thigh extensions to provide support. Rear passengers can enjoy first-class travel amenities, too, with such available features as audio and climate controls, sunshades, and reclining, heated, cooled and massaging seats. The streamlined interior provides generous rear legroom. Continental occupants also can enjoy an available Revel® audio system developed to work in concert with the interior design and acoustics, transforming the cabin into a personal amphitheater with three distinct listening modes – Stereo, Audience and On Stage. Use of the E-latch release enables optimal speaker positioning in the Continental doors, alongside the conveniently located seat controls. Innovations in managing vehicle noise and vibration, including Active Noise Control and acoustic laminated glass create a quiet, comfortable environment conducive to conversation or contemplation. For those seeking the highest expression of Lincoln luxury, three Lincoln Black Label designer themes are available – Chalet, Thoroughbred and Continental-exclusive Rhapsody. Inside, opulent materials include leather seating, leather-wrapped console and instrument panel, unique stitching, genuine wood or aluminum appliqués. All models feature new design details. Stitching on the seats is specified at six to seven stitches per inch for a couture-like appearance, and the slats of the center console door are laser-cut to maximize consistency of the grain pattern. The all-new Lincoln Continental will be produced at Flat Rock Assembly Plant in Michigan. The Lincoln flagship goes on sale this fall.